Veronica Darling: ATTN: A Free Pattern & Sewing Challenge! Hey guys, guess what? I don't think I've used captions on photos in my blog before... have you read that Twitterer (have no idea which one, and no time to find it) that started copying the Daily Mail or some UK paper's photo captions...? It's quite funny from memory, as copywriters obviously get very drained writing captions for the newspaper and they were just SO literal... just writing what was happening in the photo. Anyways! I've got some 'free' news... and I like 'free stuff' and I'm sure you do if you're thrifty like myself! But the free part: if you sign up, you'll be sent the Manado dress pattern for free... and that's the dress I'm wearing in the photos here... and my Voila - Finished blog post is here... and I found it a good straightforward pattern (even for a beginner perhaps) and a lovely light dress... I'll be making another Manado Dress for the Urban Jungle theme, just have to decide what jungle print I wanna cut up... my idea of the jungle print is not animal print but massive palm trees in neon... or a crispy white fern like pattern... still deciding. 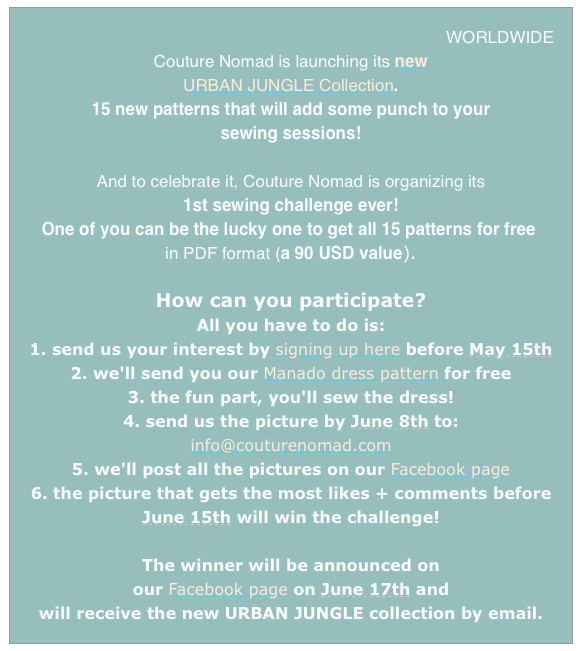 As I'm a frank & open blogger, just a note to let you know I am a paid student of the Couture Nomad workshops, and while Catherine & Amaia told me about their sewing challenge... I want to share with you some independent pattern designs that aren't often seen in the wider (UK/US) sewing blog community... and the Couture Nomad has a variety of patterns to sew up! Teacher Catherine's saying is 'Do it yourself, to be yourself' and that's just so spot on. This week, I read Gillian's blogpost about What Makes Patterns Popular and felt a bit compelled to go find the well designed under-promoted pattern companies... but hat's another story! So, happy sewing! After writing this post, I am now thinking how I can make a knit Manado Dress with more of a swing skirt to it?